I only knit for the closest people in my life. And even then, I’m usually pretty selective about the projects. I’m a working mom of two and there really isn’t that much time in the day. So when my mom asked for a blanket, I was really torn. On the one hand, she is my mom, I would do ANYTHING for her. On the other hand, a blanket is a huge undertaking. I haven’t even made my children blankets because of the heavy time commitment. If I was going to do this, it had to be something I know she would love, and that I would love making. It had to be something that I could be monogamous with, no side projects allowed if I was going to get it done in time for her birthday. And it absolutely had to be portable. Most of my knitting is done on the go. As I pattern shopped, I kept all of these things in mind, because I was so worried this would turn into a boring repetitive big project that I could only work on at home – and I would never get it done. Thankfully, I found the perfect pattern at Stitches West. They had a Knit Picks booth this year, and they were selling the Hue Shift Afghan kit at a very reasonable price, with all the yarn I needed. It’s knit a mitered square at a time, joining as you go, but only up to one quadrant at a time, so that means it would be portable. It was a little tricky juggling two balls of yarn on the go, but totally ultimately manageable. The color changes kept me interested even though each square was the same, so no getting board. And I knew she would love it because she is a huge fan of stained glass, and these vibrant colors offset by the black boarders look a lot like stained glass. This pattern checked all the boxes. It was go time! I started knitting in March, and pretty much knit a little every day where I could find time. I took it to work for lunch knitting, to the park, to the doctors office, on car trips, kids birthday parties, you name it, I was knitting there. Each new color change was so fun to watch develop. It took me a little while to get used to which stitches to pick up and where to start each mitered square, but soon enough it was all second nature and it was just a nice meditative process where I could think about my mom and thankful I am to have her in my life, and ponder how lucky I am to have her as my mother. We’ve been through the highest of highs and lowest of lows together. We laugh a lot and get into deep philosophical discussions when we get together. She is easily one of my soul mates, if that is possible. Making this was so fun as each quadrant was like a mini finished object, in and of itself. I had the rush of finishing each quadrant every couple months. I was pretty monogamous with this project, the exception being a tiny newborn hat that took all of 1 day from start to finish. I finished all the knitting near the end of August, and I have to admit that I was a bit intimidated with all the ends to weave in, plus the seaming of the four quadrants together. Finishing has never been my strong suite. The finishing took place over labor day weekend with some good company who tolerate my crafting habit while we hung out. That made weaving the ends in very enjoyable. The mattress stitch was easier than I expected too. And the end result is just lovely. I gave my mom her the blanket today, and I can’t wait to see her wrapped up in this cozy rainbow during the winter. My kids and husband want one now too, and I will definitely be making this pattern again. It was an absolute joy to knit and I highly recommend every knitter to make it! I would love to splurge and make this with some luxury yarn. The Knit Picks yarn is just ok. The good thing is that it will be durable and it was very affordable. Someday I’d like to spin enough yarn to make one from handspun. HA, with the rate at which I spin, that will be one epic project! The journey to this FO started a year (or more) ago when I got some beautiful Malabrigo Nube fiber. 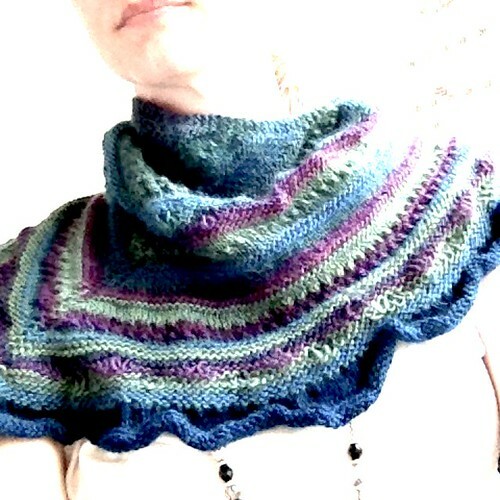 I had decided way back then that I wanted to knit a shawl out of handspun. That meant that I needed to make sport weight or lace weight, and for me, that meant spinning a 2-ply yarn. If I had done a 3-ply, it would likely result in a light DK or thicker yarn. Life intervened though and I only spun up half of the fiber. That half waited patiently in a closet for the day that might never come. I wasn’t even sure if I could still spin to be honest. Then entered the wettest winter California has seen in 10 years. Something about cold stormy days awakens the deep desire to work with wool. On rainy days my absolute favorite thing to do is to pour myself into the making of fibery things that will keep my loved ones and myself warm and cozy. I finished spinning the second ply over a three day weekend, and only let it sit for a night for fear that I wouldn’t ply them for another year. I wasn’t sure what would happen with one ply having sat for over a year and the other ply only for 1 night. But, I plowed forward. The yarn itself won’t win any awards for balance, but it was the right thickness and Malabrigo colors never fail to amaze me. I got 304 yards out of the 4 oz. of fiber. Now to pick a pattern. I wanted a shawl that wasn’t too complicated. No charts or complicated repeats for me at this point of my working mom schedule. Plus, the handspun yarn can stand on its own. I didn’t want it to compete with a complicated pattern. I scoured Ravelry and was trying to decide between three similar shawls that could be easily modified to use up all of my handspun yarn. Reyna by Noora Laivola has been in my favorites for a long time, it looks great with a marled yarn. The Citadel had a similar concept, of striping rows of lace and garter, also with a center spine, but with thinner stripes. Then I discovered Ardent by Janina Kallio, and it had thicker panels of lace and garter and it was more of a crescent shaped shawl (i.e. no center spine), but still in a v-shape for the most part. This gives it a lovely modern look of big side sweeping lace stripes. I fell in love. I couldn’t stop knitting this shawl. The pattern was clear and easy to keep track of. It starts at the small end, so progress is fast immediately. Then I just would sneak in row after row in the morning, before bed and at lunch if I had a spare 10 minutes. I had enough yarn to do an extra repeat, leaving only a tiny ball of unused handspun. I still wasn’t totally convinced after binding off that this was really the right pattern for the yarn, but it really came to life after blocking. It’s super light and lofty. The lacework is staying open and I was happy to see that the colors don’t overwhelm the lace stripes either. It’s light and warm and cozy as a dream. This is a fiber story from roving to toy. It is also a love story dedicated to my dear daughter. 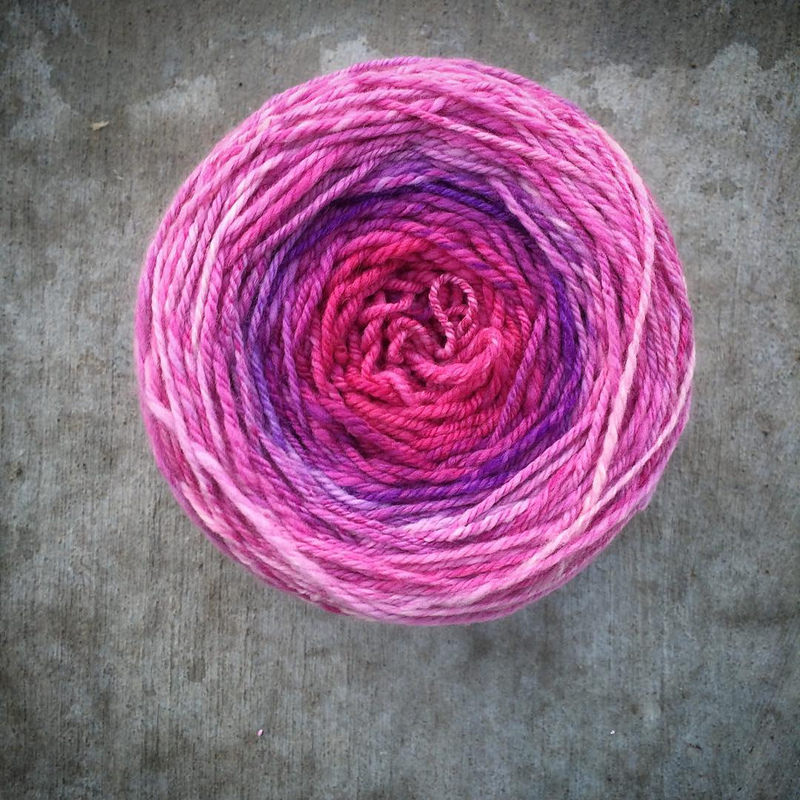 It all starts last summer when I received some some bright pink and purple roving for my birthday. She instantly claimed it as her own and I was happy to oblige. The fiber was Malabrigo Nube, colorway Baya Electrica. You can find it online for about $15 at places like Yarn.com or Jimmybeanswool.com. Pretty decent price for 4oz of 100% Merino, and the colors – priceless. The fiber was a bit felted in places though which was expected based on the reviews. So doing a bit of extra prep up front seemed like a good plan to make the spinning much more pleasant. I’ve always wanted to spin a gradient yarn, so this would be the perfect fiber to try fauxlags. I watched this video and this video to learn how to make fauxlags and began to separate the colors. I took over the entire kitchen table for a few hours to make this happen! Once they were all rolled up, I used this old document box lid to organize them by color so that they were all ready to spin up. I definitely need more practice making fauxlags. Some spun up easily, while others were too loose and pulled apart in clumps. Overall they were really fun to spin though. The progress went by quickly because everything was bite sized. I could easily see how far along I was and it was hard not do “just one more”. After all the singles were spun, I used chain-ply to make a 3-ply yarn and maintain the gradient effect. 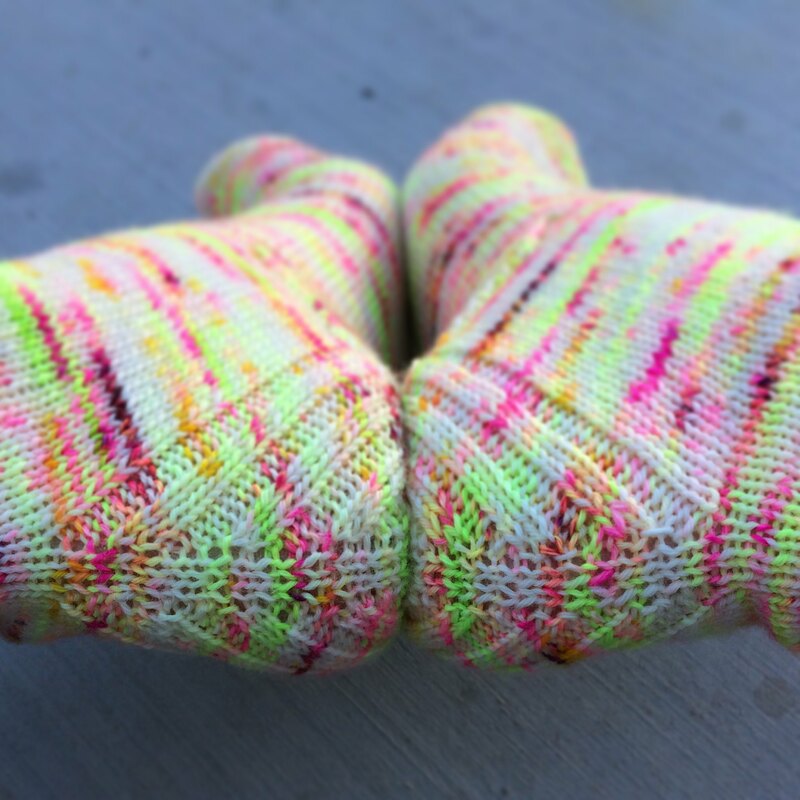 It was so fun seeing the resulting yarn come to life! I believe I ended up with about 100 yards of worsted weight yarn, here’s a link to my ravelry spinning project page. 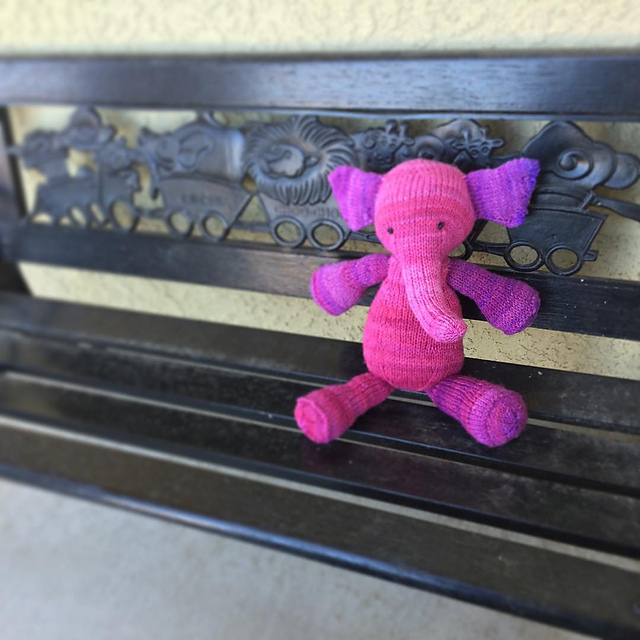 Perfect for making a little pink elephant for my daughter. I have knit this elephant pattern called Elija by Ysolda Teague for my son years ago. She loves it and the yarn is holding up really well. I was a bit worried that the handspun would wear out quickly, but it’s been nearly 6 months now and it looks as good as new! The amount of love and care that went into making the yarn and knitting the toy was well worth it. Knitted swatch of a 3-ply Navajo plied yarn. Hi! This post is all about Navajo plying, also called Chain plying. I’ve been on a break from blogging for quite a while, but I’m back and will try my best to keep up with it. I’ve been really getting in to spinning lately, so I want to keep some notes that have helped me and hopefully they will help others as well. 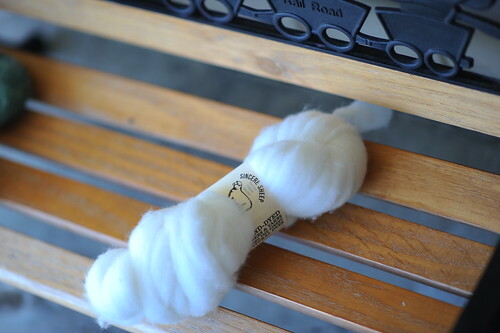 It’s a way to make a 3 ply yarn out of one single by plying it onto itself. You make a loop with the single, pull a length through it, which forms a new loop and repeat. 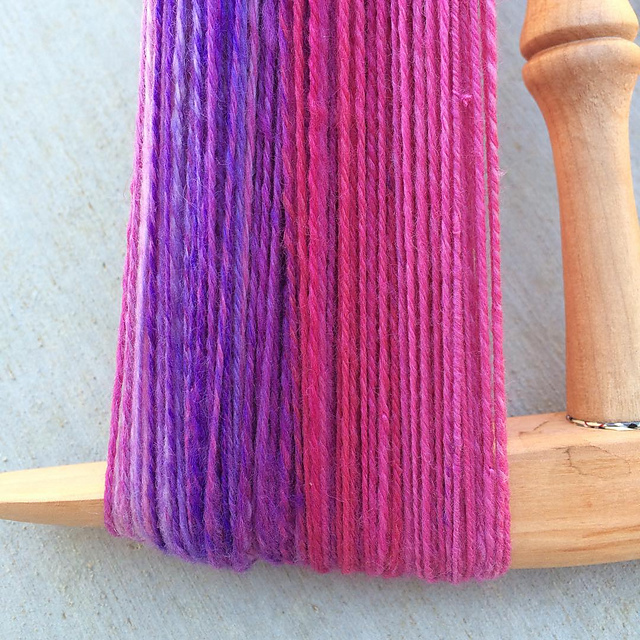 Since it is plying onto itself, the colors stay together to instead of getting single plies that make a “barber pole” effect with different color singles plied together. It’s great for making gradient yarn which is one of my current obsessions. Sarah Anderson has a very easy-to-follow video of chain plying. One hand stays close to her body keeping the loop open, while the other hand controls where the twist goes in and feeds the wheel. I fumbled with chain plying until I watched this video. It’s the best video I’ve found on Navajo ply. 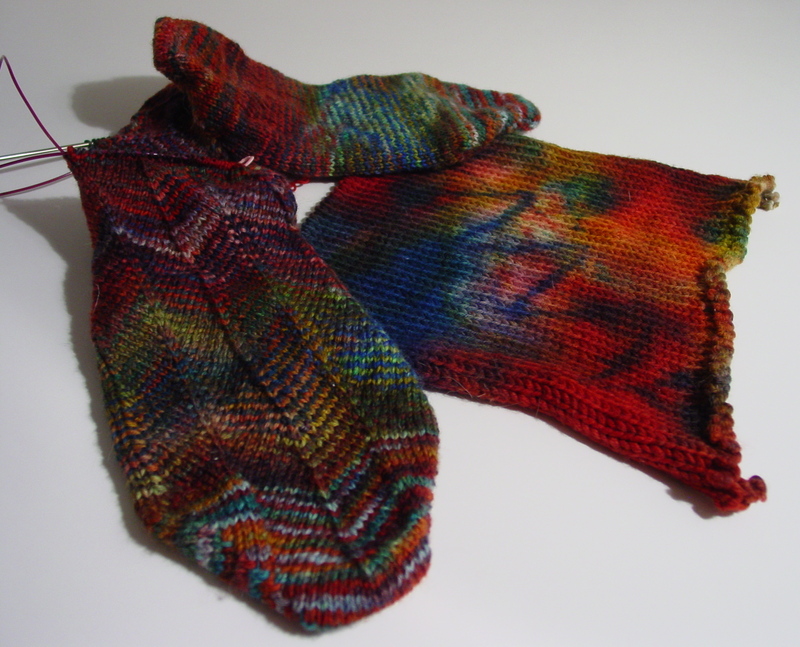 What do you do if you are short on yardage to finish a project? This is the Pleiades pattern by Beth Cling. It is basically a scarf in a crescent shape. She describes it as a shallow, curved shawlette. The pattern is written really well. Each technique was described thoroughly, a beginner with a little experience could follow it easily. My only problem was yardage. I knowingly used a smaller needle size because that’s all I had, but I didn’t anticipate how short I would be. I can either bind off now and completely miss the 2×2 rib section, or I can add another color which might look really cool, or could make it look horrible…. What would you do? My husband said to me one day, why don’t you just buy more yarn?? I hadn’t even thought of that because hand dyed yarn can be so different if they are from different dye lots (I learned that the hard way). But I decided to give it a try. To the trained eye it is obvious, but to the other 99% of the population it is virtually undetectable. So, nearly a year later it is finished and I can enjoy this cozy frilly knit. There are progress photos available in my project page in Ravelry. I highly recommend this knit and yarn, oh my gosh, the yarn was particularly great! This was the first time for me using Miss Babs yarn. I absolutely love it. If you haven’t used it, you must give it a try. The aptly named, Yummy 3-ply sock yarn, is so squishy, and the subtle color changes made this semi solid interesting the whole time. Can you see where the color changed?